Tatton Park (left) and Jeff Koons’ Cracked Egg at Waddesdon Manor. While some fortunate folk are racing off to the Hamptons or flying to Nantucket, the hoi polloi are often stuck steaming in the city. This summer, take a mini-break and find refuge from the heat in an urban oasis, no travel required. What’s in your garden? 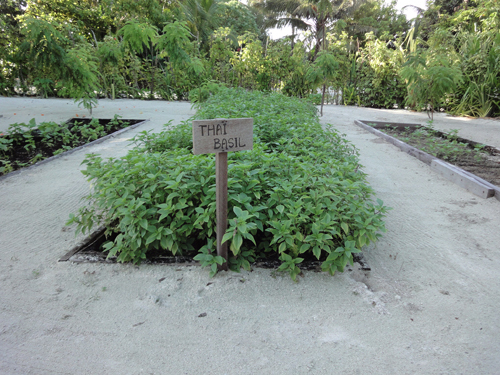 Anantara Dhigu divulges the juicy scoop on the resort’s chef’s garden. Check out the growing there. Not only do the 12 varieties of organic herbs and vegetables add punches of flavor to food and several offer holistic benefits. This may be inspiration for starting a backyard garden, or at least planting some herbs on the fire escape. For good health: Chilis contain capsaicin, a chemical that benefits the respiratory system, blood pressure, and heart. Eating lots of chilis also raises body temperature which can speed up metabolism. For good health: While arugula seeds are historically thought to be an aphrodisiac, its leaves are known to stimulate digestion and promote healthy hair, skin, and nails. For good health: The leafy green is a rich source of vitamins A, C, and K and promotes improvement of vision and the proper growth of bones and teeth. For good health: this root has many perks, thought to be an aphrodisiac and known to help upset stomachs and calm nausea from motion sickness and morning sickness. This fall, stave off that sad summer-is-over feeling with a trip! Take in all that the season has to offer in a cozy English cottage and check out the happenings of a British autumn. Festivals with local cuisine dapple the September calendar and country houses are surrounded by orchards brimming with fall fruit. Go: The Big Green Food & Craft Festival at Beningbrough Hall will have great Yorkshire food and crafts, fresh produce, and a Hog Roast. September 25-26. A cozy apartment in a medieval building right in the town of York – perfect for exploring on foot. Go: A World War II event in Northumberland gets visitors to think of wartime food, rationing, and Victory Gardens. Weekend of September 25. Previously part of Wallington Estate’s stable block, this stone house is built around a central courtyard and is close to the grand estate’s main house. Go: Get tempted at the “Taste and Temptation” weekend at Petworth House and meet local producers and taste their delicious, fresh products. September 26. Surrounded by farmland, this quaint country cottage retains many of its original features, such as an internal well and large fireplaces. Go: The beautiful island of Anglesey has dramatic cliffs, sandy beaches, and mountain views of Snowdonia. This stately Georgian farmhouse has a large walled garden full of apple trees and has a view over the wild Llanlleiana Bay. Go: The fascinating Calke Abbey is filled with fascinating possessions and surrounded by a National Nature Reserve replete with trails. This 18th century brick farmhouse is flanked by fruit trees and sits on the south side of the Calke Abbey estate, formerly used as its dairy. Go: Hell’s Mouth Bay – despite its foreboding moniker – is a great place to swim and surf. In autumn the water is still warm and the waves start picking up again. This remote cottage sits on a hillside overlooking the bay and is accessible only by a walking path. Go: Enjoy the gorgeous beaches of Cornwall and the gregarious charms of Polzeath, known for its surfing. This tranquil cottage is a stone’s throw from the town and has sweeping views of the countryside and the coast. Go: Explore the cobbled lanes and idyllic houses of Clovelly in Devon this fall, when all the summer crowds have dispersed. Hidden in the woods about a quarter mile from the shore, this cottage is a great retreat for exploring the rugged coast. 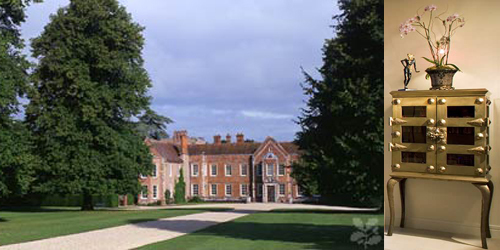 This mixture of historic and contemporary at The Vyne is in keeping with the vision of The National Trust to view a house as a living and evolving space. Visit the bedazzled abode now through August 1 for FREE as a member of the Royal Oak Foundation (The National Trust’s U.S. affiliate). Membership, just $55 to join, grants access to all of The National Trust properties around England, Wales, and Northern Ireland. Nantucket is a classic New England getaway, but did you also know that it’s a great place to get your surf on? On The Today Show last Thursday, Condé Nast Traveler’s Kate Maxwell filled Matt Lauer in on the underground surfing scene at Cisco Beach on Nantucket Island. Kate suggests surfing during the day and cleaning up for dinner at the White Elephant’s Brant Point Grill in the evening. Watch the video below to get all the inside scoop! Remember when we told you about the Elephant Parade, the installation of model baby elephants scattered around London? Run by Elephant Family, the goal of the charity is to raise awareness of the declining population of the Asian Elephant. 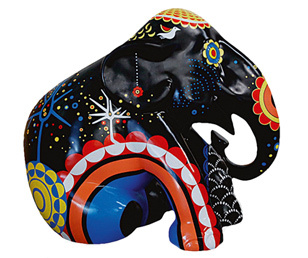 ‘Little Bird,’ the baby elephant representing Anantara Hotels, Resorts & Spas, is somewhere throughout London. Now there is a little extra incentive to finding her, as the Director of Elephants at Anantara Golden Triangle, Mr. John Roberts, has announced that he would give out a free dinner to the first person to send in a photograph of themselves with ‘Little Bird’. And that’s not all! Elephant Family is offering the chance to win a vacation for two to none other than Thailand’s Anantara Golden Triangle where the lucky winners will train with mahouts at the resort’s famed elephant camp and learn about these gentle creatures. To enter, visit http://www.elephantfamily.org/how-can-you-help/events/competition/, fill out the petition, correctly answer the questions, and tweet a message to encourage your followers to sign the petition. The competition closes on July 9th, so hurry before it is too late! The elephants are on the move! As the Elephant Parade comes to a close, 62 of these life-size, model baby elephants will be migrating from their positions around the city and congregating in Leister Square. July 3rd will mark the end of the parade, when these magnificent pieces of art will be auctioned off in hopes of raising over $2 million! A bit of abstraction seems to have crept its way into the Georgia O’Keeffe Museum in Santa Fe. Famously known for her representational depiction of flowers, O’Keeffe is delighting fans with a new style. Comprised of over 100 pieces, the Georgia O’Keeffe : Abstraction exhibit features nearly blank canvases broken up with perfectly placed strokes of color. Viewers agree that this unknown side of O’Keeffe has allowed her to truly capture the essence of her subject, as well as highlighting the relationships between the different works of art. 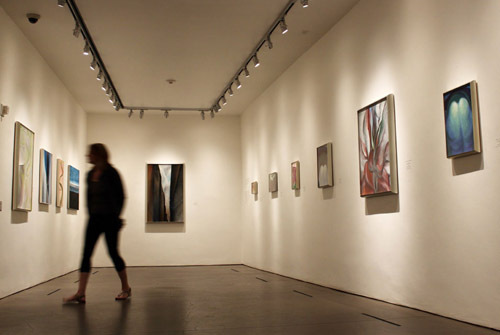 The 4,000 attendees on opening weekend agree that this abstract collection is a must see. Need a place to stay in the “city different”? After checking out the museum, head back to the Inn on the Alameda where guests can indulge at the daily afternoon wine and cheese reception.